Whatever will we come up with next? 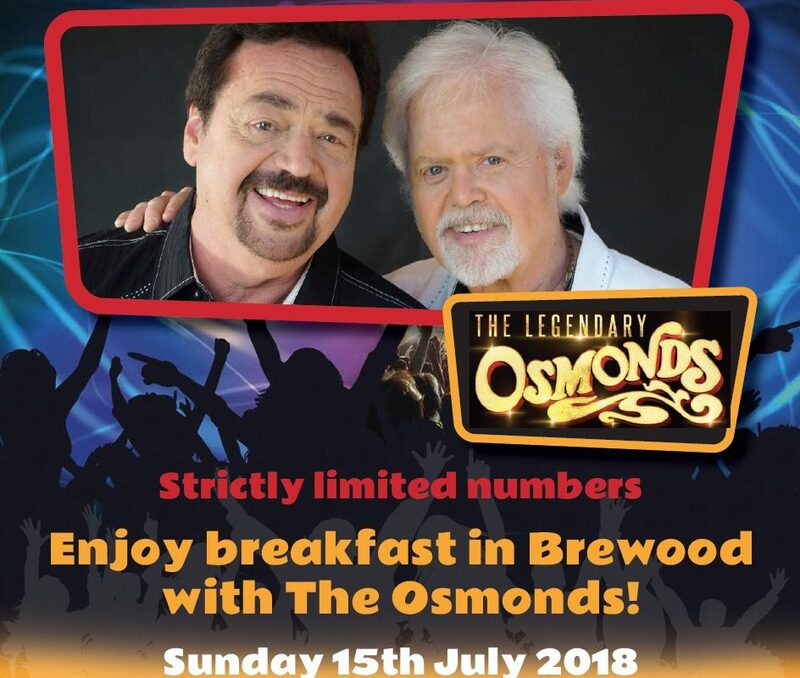 Not content with simply enticing the sensational, Legendary Osmonds to our small South Staffordshire village, now we’re able to offer a lucky few of you the once in a lifetime opportunity to enjoy breakfast with the band. Fresh from performing for us the very night before, Merrill and Jay Osmond have agreed to enjoy an up close and personal breakfast in intimate surroundings with a lucky few festivalgoers on the morning of Sunday 15th July. Fans can book their place at this exclusive event by clicking the link at the bottom of this article. But, don’t delay as this is a strictly limited opportunity and is only offered on a first come, first served basis. Once booking is complete the lucky purchasers will receive an invitation by letter to a secret location with more details about timings and menu options. As well as enjoying a wonderful breakfast fans will have plenty of time to hang out with the guys, take photographs and get autographs. Merrill and Jay were original members of The Osmond Brothers in the 1960s. They were regulars on the Andy Williams Show and The Jerry Lewis Show before taking the world by storm in the early 70s. Merrill was most definitely the lead voice of The Osmonds throughout the decade with Jay stepping up to the mic to take the reins on arguably the band’s most enduring hit ‘Crazy Horses’. The cost of this one-off opportunity is only £50 per person and once all the spaces have gone there will be no more released. The breakfast will take place in and around the Brewood area with lucky ticket holders informed of the exact venue and time nearer the event. Ticket sales for this event have now closed.